Eurocom Corporation, a leader in the Desktop Replacement notebook technology since 1989 has launched a new category of notebooks called Mobile Workstation. With the release of new mobile workstation category of notebooks, Eurocom is taking the next step in the evolution of the desktop replacement by combining workstation like features, power and flexibility with desktop replacement technology. Professionals using desktop based workstations are limited today to large expensive systems complicated to operate, fixed locations, lack of portability, and the need to work and maintain with at least two computers systems, one in the office and one outside, resulting in high operating cost ($6000 USD per system yearly cost of support). They are unable to work outside of office with customers due to lack of sufficient power and flexibility of traditional notebooks currently available on the market. With the creation of the new class of notebooks, producers, designers, engineers, architects, programmers, animators, film editors and special effects gurus can go mobile and practice their craft anywhere they see fit equipped with mobile systems capable of running 3D modeling and engineering software with a single computer solution. In considering the types of people that require large amounts of processing power in order to be productive, several groups come to mind. The mobile workstation market encompasses design professionals such as engineers and architects who require high performance computers and are thus limited to working on multiple computer systems. Using mobile workstations on a job site or as a sales tool for live demonstrations of virtual walkthroughs and 3D modeling will give edge to firms who wish to appear tech savvy. Digital Content Creation (DCC) is one area that is growing daily along with the growth of the internet. DCC also can make use of portable processing power. With the instantaneous nature of the internet, having a mobile workstation on hand for real time image capture, video editing, sound mixing and graphic work will allow companies to bring all kinds of services and information to the web in real time (shareholder meetings, press conferences etc.) Digital Content Creation is not just limited to web work either but to all kinds of design work for marketing, advertising, writing, coding, Flash design, Photoshop work etc. Another market for the mobile workstation lies of course with gamers. No other group demands the latest and most powerful hardware and has been willing to pay a premium for it. This group is looking more and more at mobile systems that allow them to come together at LAN parties and compete en-masse for prizes and pride. This group also is heavily into customization of their hardware, and very knowledgeable about the latest equipment. 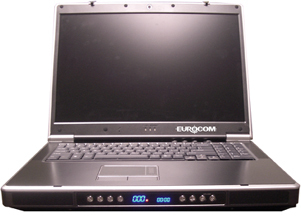 Eurocom hardware has found much success with this group already. There is another trend in the market that makes the portable workstation ideal for a growing section of the workforce; outsourced, freelance and tele-workers. The finance and accounting outsourcing market alone is expected to generate $37.7 billion worldwide by 2004, according to research firm Gartner Inc. Some estimates price the global outsourcing market at $300 billion annually. All kinds of jobs are being outsourced, including engineering, design, marketing, accounting and more. These jobs are being done by people that need to be mobile, but also demand a high degree of productivity from their equipment. 6. two FireWire (IEEE1394a) ports and ExpressCard slot. or AMD 64-bit Athlon up to 3700+ processors for greater stability and higher performance for today's demanding mobile users, wireless mobility, and long battery life and built-in support for next generation AMD64 software. DDR2 is the next logical progression for memory standards and speeds. It incorporates several new designs and specifications which play a part in its increased speed. DDR2 allows higher processing speed due to higher density of the memory chips. 16x PCI Express supplying up to 150W of power to NVIDIA graphics card. The EUROCOM D900 Phantom is the1st notebook with PCI Express architecture. PCI Express architecture provides for extremely high bandwidth at low cost. PCI Express can offer up to 70 times the bandwidth of today's PCI architecture and is scaleable for the future. support SATA - a new interface development that runs in a serial mode instead of the parallel mode of the older IDE standards which allows for greater bandwidth (1.5 GB/s) and smaller cables. SATA transfers data in a single stream (serially) in comparison to PATA that transfers in multiple streams. Level 0 is disk striping only, which interleaves data across multiple disks for better performance. It does not provide safeguards against failure. RAID 0 is widely used in gaming machines for higher speed. Uses disk mirroring, which provides 100% duplication of data. Offers highest reliability, but doubles storage cost. RAID 1 is widely used in business applications. Portable storage: Standard internal 7-in-1 card reader supports all major memory cards such as: Secure Digital/MultiMediaCard, Memory Stick, SmartMedia, CompactFlash. choice of drives such as: DVD-ROM, COMBO drives (DVD-ROM and CD-RW), dual 2x, 4x DVD Burners (DVD+-R/+-RW) and 4x Slot Super DVD Multi Drives (DVD-RAM/+RW/-RW; CD-RW; DVD/CD-ROM). High performance Sound-Blaster Pro compatible audio system with virtual 6-channel audio output; S/PDIF Digital output (5.1 CH), 4 internal speakers and optional sub-woofer offer home theater-like experience. audio on D900 model: AC97; 3D stereo; virtual 6-channels; SB Pro. 1x Kensington port for Security Cable and Lock. We live in a stressful world, and nothing is more stressful than knowing you have no control over the environment in which you work. Eurocom wants to give more people the opportunity to make use of the latest technology where they feel the most comfortable. For some people that is in the office environment, but for many and increasingly - it is at home, at a friends' house or at the coffee bar. Can you imagine lugging a bulky 200 pound workstation into Starbucks? By offering a new complete mobile computer solution such as mobile workstation, Eurocom invites people to empower themselves and decide when and where they are at their most productive.